A banning order is an enforcement tool available to the Australian Securities and Investments Commission (ASIC) enabling it to deal with breaches of the law. Such an order aims to protect consumers by removing unfit people from the financial services industry. Since 2002, ASIC has banned over 390 people from working in the financial services industry. However, ASIC found that the banning order regime had a number of limitations that hindered its use of the sanction. These limitations restricted ASIC’s ability to protect investors because of the manner in which they confined the regulator’s ability to remove from the industry certain people who may cause losses to consumers. ASIC raised these concerns during the 2009 Inquiry by the Parliamentary Joint Committee on Corporations and Financial Services into Financial Products and Services in Australia, and the Committee subsequently proposed changes to the banning order regime. As a result, the Corporations Amendment (Future of Financial Advice) Act 2012 (Cth) introduced amendments to s 920A of the Corporations Act 2001 (Cth). This article considers the banning order regime under the previous s 920A and then focuses on the changes to the regime to determine whether the changes were needed. This article analyses the effectiveness of the Corporations Act 2001 (Cth) as a regulatory tool for the sector. The Act regulates the conduct of directors by (i) establishing liability and (ii) imposing sanctions. The liability-sanction relationship determines the effectiveness of regulation. The relationship is further affected by the correlation between the sanctions imposed and the principles supporting those sanctions. 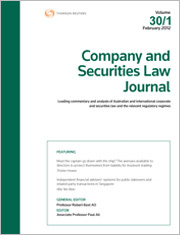 This article uses Australian Securities and Investments Commission v Healey (No 2) (2011) 196 FCR 430 as a case study to evaluate the effectiveness of the Act in regulating the conduct of corporate directors. The article concludes that the sanctions imposed on the errant directors are not supported by the principle identified as underpinning them. Further, the article makes recommendations in relation to more appropriate sanctions in circumstances similar to those in the matter under discussion. For the PDF version of the table of contents, click here: LOLA – C&SLJ Vol 31 Pt 6 Contents or here: WAU – C&SLJ Vol 31 Pt 6 Contents.